News — McDonald Building Co. Whether it's a new project, constuction industry updates, an employee teaming event or an opportunity to celebrate the best in our community - there's always something to talk about at McDonald Building Co.
Today, Project HOME along with its private and public partners & supporters, kicked off its newest project, Maguire Residence, in the Kensington area of Philadelphia. This entire city block of a former elementary school will be repurposed into 42 recovery units for those who have experienced homelessness and are committed to recovery. Construction is expected to begin Winter 2019 and complete early 2020. Today, November 9th, 2018, project partners, construction crews and funders signed the last steel beam and it was placed on New Market West reaching the first milestone in the new construction of the building. There is a significance to the pine “topping” tree, they celebrate completion of the skeleton of a building structure. The evergreen is attached to the top beam as it is hoisted, a signal that the building has reached its final height. For some, the evergreen symbolizes good luck and prosperity for the future occupants of the building. New Market West is a four story, 135,700 square foot hub for retail and community services on a 1.5 acre vacant site near the 60th and Market Street El stop in West Philadelphia. The building will bring high quality early childhood education; workforce development, educational and emergency support services; behavioral health services; and community-serving retail to this transit-accessible location. New Market West is a joint venture between Mission First Housing Group and Horizon House, two organizations with a long history of creatively using their expertise in affordable housing and human service delivery to make a difference to people in need across Philadelphia. Now, with the strength of community-based partner ACHIEVEability, the organizations have an opportunity to bring this work to the Haddington-Cobbs Creek community. The Construction of New Market West is a joint venture between McDonald Building Company and Mission First’s general contractor Columbus Property Management. Construction is expected to be complete by fall 2019. McDonald Building Company is proud to announce that Tom McDonald recently joined the firm as Vice President of Operations to expand the company’s leadership team and executive project management staff. During his 32 years of experience as Vice President and various other roles at a leading regional construction management firm, Tom led many multi-million dollar development deals for both the public and private sector throughout the Mid-Atlantic Region. Most recently, Tom played an integral role in the prominent $1.5 billion Comcast Technology Center – the first structure in Philadelphia to exceed 1,000 feet and scheduled to be complete this year. Other notable projects under Tom’s leadership include Temple University’s Mitchell & Hillarie Morgan Hall Student Residences (Phila, PA), AtlantiCare Regional Medical Center City Campus (Atlantic City, NJ), Gloucester County Judicial Center (Woodbury, NJ) and Marriott’s Fairway Villas at Seaview (Absecon, NJ). Tom’s notable strength and considerable knowledge in subcontractor coordination, scheduling, and contract negotiations with large-scale construction jobs will serve as an invaluable contribution to McDonald Building Company’s strategic growth and development. McDonald Building Company offers full construction management services in healthcare, commercial & retail, education and mixed-use multi-family housing projects throughout Philadelphia and the surrounding metropolitan areas. Among other responsibilities, Tom will be leading the construction team at New Market West, a 5-story mixed-use and Class A Office development in West Philadelphia. Prior to beginning his career in construction management, Tom enjoyed a career playing professional soccer for various teams throughout the US. Tom holds a LEED BD+C accreditation and is a graduate of Philadelphia College of Textiles and Sciences (now Jefferson University). Please join McDonald Building Company in welcoming Tom to our team. On Friday, McDonald Building Company joined city and state representatives for the official groundbreaking of New Market West, a 1.5 acre abandoned lot near the 60th and Market Street El stop in West Philadelphia that will soon transition into a hub for retail and community services in the Haddington and Cobbs Creek neighborhoods of West Philadelphia. In collaboration with McDonald Building Company’s Joint Venture partner, CPM Housing Group, New Market West will include the construction of a five-story Class A commercial office & retail building with an 80-space underground parking garage. The project will bring high quality early childhood education, workforce development, educational and emergency support, community outreach services, and behavioral health services. 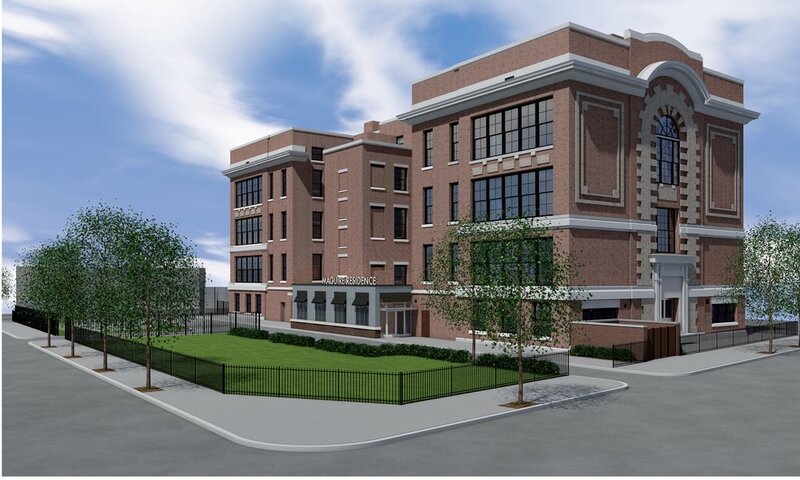 “We are honored to once again join forces with Alfredo de la Pena and the Mission First team on another landmark project in West Philadelphia. New Market West will be a beacon for the community creating much needed jobs during construction and for years to come,” says MBC President Paul McDonald. This transit-accessible location is expected to create 120 temporary full-time construction jobs and once completed, the project anticipates the creation of nearly 100 full-time permanent jobs. The project is hosting a construction job fair for all trades this week on Thursday, February 22nd, 2018 3pm-8pm at Home Health Care Plus, 6011 Market Street. Visit http://www.mcdonaldbc.com/careers for more info on the job fair. Kitchen & Associates of Collingswood, NJ is the Architect of Record and construction of New Market West’s first phase is expected to be complete by the fall of 2019. For more project info and to view renderings, click here. Earlier this year, we had the pleasure of welcoming Frank Lewery, a co-op from Drexel University for some exposure to the professional field of construction management. Frank joined us in the springtime to take on some responsibilities in the estimating department and assist in the bidding process for a handful of potential projects, some of which were awarded. Namely, Frank had the opportunity to work on the Holt Center @ Holy Ghost Preparatory School in Bensalem along with the S.T.E.M. Lab there as well. He played a vital role throughout the bidding process – evaluating the design documents, trade buyouts & scope evaluations, and daily interactions with our potential subcontractors. This was Frank’s first co-op in a series of the required three and is an active member of the American Society of Civil Engineers. Frank is an avid ice hockey player and in addition to playing on the Drexel University team, he has served as Captain on numerous ice hockey squads in his hometown of Staten Island, NY and surrounding areas. Frank has volunteered for various organizations during his early college career including “Cook for a Friend” Soup Kitchen and relief efforts for Hurricane Sandy. He anticipates on graduating from Drexel in the spring of 2020 with a Bachelor of Science in Civil Engineering.